The ‘H’ on the birthday cake says it all. Happy hwee yee! Happy birthday! The jason pollock design was made by xiaoliang. Neeedless to say, she loved it. Both swinging chocolate ganache on the cake and eating the cake. Melt butter, chocolate and sugar in a mixing bowl placed atop a saucepan of simmering water. Stir gently to mix and encourage even melting. When melted, set aside to cool while we prepare the rest of the ingredients. Preheat the oven 170 deg C.
Add the eggs one by one, whisking (by hand is fine) to mix into the chocolate mixture. Add flour salt and espresso powder. Whisk to combine. Allow the brownie to cool completely before frosting. Put chocolate into a medium bowl and cream into a saucepan. Heat the cream to a gentle boil. Turn off heat, count to 10 and pour into the bowl containing the chocolate. Let it stand for a minute. Stir till smooth. Allow ganache to cool for at least 15 mins. Use a spoon to form streaks of chocolate on the frosted brownies. Optional: decorate further with random scattering of valrhona crunchy chocolate pearls. 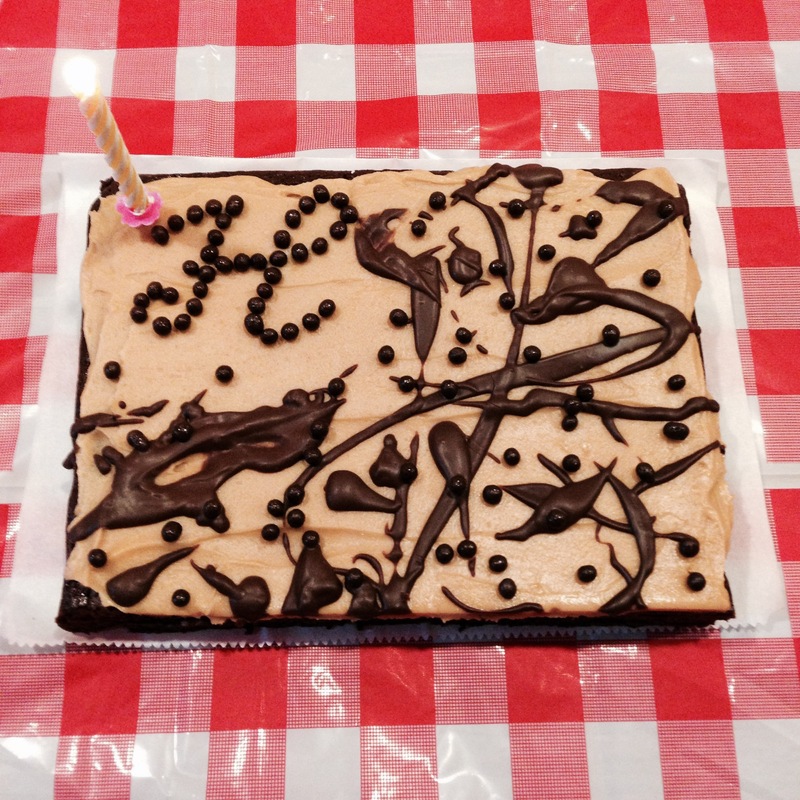 This entry was posted in Bake and tagged birthday, brownies, chocolate, peanut butter on September 9, 2014 by three3seconds.